IT continues to become more complex, driven by industry megatrends like big data, mobility, the cloud, and security challenges. 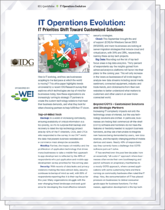 New research from IDG explores the top IT priorities and how they are driving the need for custom IT solutions. Survey results from IT Directors, CIOs and CTOs revealed that 38% of respondents have a challenge that an “off-the-shelf” solution can’t solve. Download the white paper for more insight as you plan for the year ahead. © 2015 WEI. All rights reserved.